This watermelon drink recipe is the perfect way to use extra watermelon and cool off on a hot day. Watermelons are so sweet, refreshing and abundant in the summer. If you are like me, when you see a big bin of them for $3.99 it’s hard to resist buying a whole one. Cutting and storing this massive fruit is another thing but totally worth. That was my situation recently. I cut up a whole watermelon but I couldn’t finish it. Even after giving Biscuit (my dog) a few cubes throughout the week, I still had a ton of watermelon chilling in the fridge. Luckily, you can freeze watermelon and create some delicious desserts and drinks. Using just three ingredients and no added sugar, this recipe is as simple as it gets. Watermelon is more than 90% water. So as decadent as it seems, it’s actually a low calorie treat! Three ingredients and a blender take you to a sweet and refreshing destination within minutes. Add the watermelon and lime juice to a blender. Puree until smooth. Add the fresh mint and puree just until blended. Pour into chilled glasses and have a sip of summer! My watermelon was perfectly sweet so there was no need for added sugar. Taste yours to see. 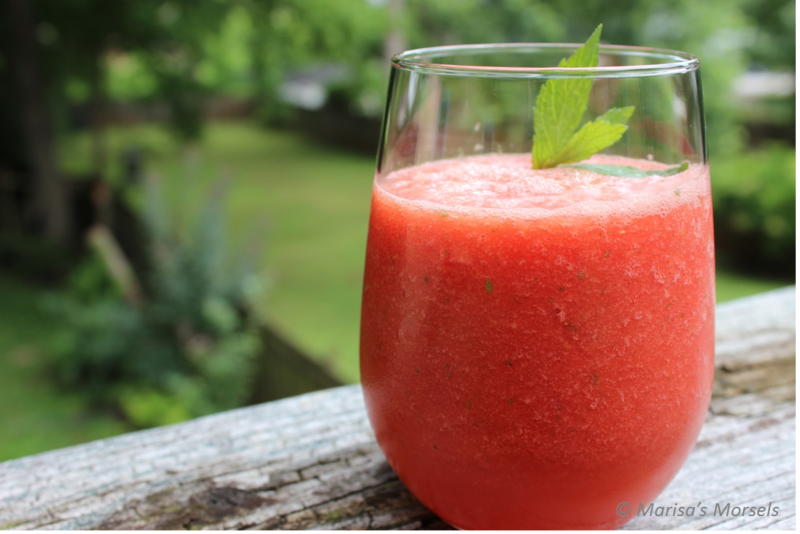 If you liked this post, try this Watermelon Lime Granita from the Morsels archive.